Although babies don’t normally speak until they’re 12 months, their brains begin developing speech and language abilities even before birth. These communication skills are essential for healthy childhood development. 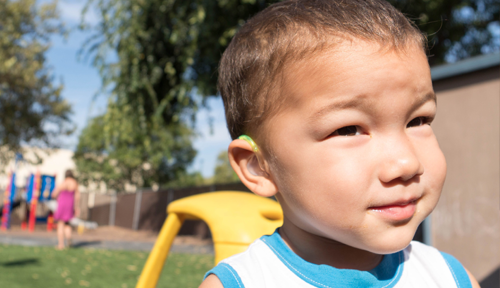 However, hearing loss is a neurodevelopmental emergency that can impede this progress and stunt a child’s cognitive, psychological, and emotional growth. If discovered early enough and managed properly, it’s possible to provide your child with the developmental tools required for lifelong success. However, the window for intervention is very small. 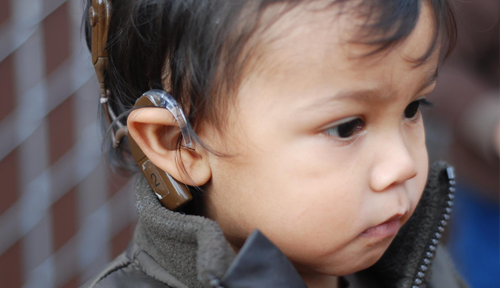 And for optimal results, it is best to identify any potential hearing impairments or challenges before the age of 3. But how do you know if your child is deaf or hard of hearing? The simple answer is – you get them tested. But hearing tests for children aren’t as straightforward as those for adults. Older patients can communicate their needs and provide real-time feedback during routine exams. But at CCHAT, we offer a range of hearing assessments designed to correctly identify audiological complications in children of all ages – hearing loss can be detected even when the baby is only a few days old. Assistive technology like hearing aids. Early intervention services and counseling. Below are some of the newborn and toddler hearing tests we offer at CCHAT. Behavioral Observation can be combined with Visual Reinforcement Audiometry – an approach that uses animated toys and videos to help induce responses to certain sounds. If your child is slightly older (e.g. 30+ months), we might include games and puzzles as part of our Play Audiometry evaluation. The above behavioral assessments are an important starting point since they allow us to measure your child’s natural response to both visual and auditory stimuli. However, we also use additional testing to examine the mechanical workings of your child’s ears and brain. This branch of diagnostic evaluations includes the following tests. With Auditory Brainstem Response, electrodes are safely attached on your child’s head and around his or her ears. The electrodes then measure whether sounds are correctly being captured and transmitted along the auditory nerve. Some ABR testing involves sedating the child. But with our noninvasive approach, we can accurately diagnose the degree of hearing and neurological function – without using any medication. With this type of diagnostic testing, we analyze the inner ear’s infrastructure to determine if echo patterns are created in response to auditory stimulation. When these echoes are present, we can conclude that the internal structure of the ear is healthy. The absence of these echo patterns, however, indicates some type of potential hearing loss. And further investigation is required. Also known as tympanometry, middle ear evaluations involve sending air through the ear canal to measure the speed and degree of the eardrum’s vibrations. Excessive wax buildup, insufficient fluid, or ear infections are just some of the factors that can prevent proper functioning of the eardrum. Why Have Your Child’s Hearing Tested With CCHAT? At CCHAT, we conduct an entire battery of tests to diagnose your child’s hearing capabilities and begin addressing the cause of any potential impairment. We offer more than just hearing tests for children. Since launching in 1996, we’ve developed an entire educational curriculum designed for newborns, infants, and toddlers who are deaf or hard of hearing. In addition, we work closely with area physicians and school personnel to ensure your child’s audiological needs are met. Through this comprehensive support, our goal is to provide your child with the confidence and skills needed for a normal, happy, and productive life. 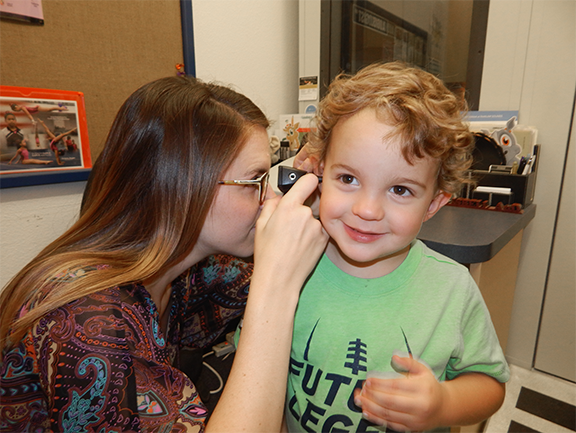 Ready To Have Your Child’s Hearing Tested? If you suspect your child may be deaf or hard of hearing, don’t delay. The sooner you get him or her tested, the better. Early intervention is an essential component of proper treatment. We now accept a variety of insurance plans. Appointments are scheduled Monday through Friday between the hours of 8 a.m. and 4 p.m. We’re ready to help. Contact us today! To get started, schedule a hearing test for your newborn or toddler today.